To save money and improve communications capabilities, businesses are increasingly turning to SIP trunking, where a company’s voice calls are transmitted over the internet rather than telephone lines. Yet the popularity of SIP trunking has brought more providers into the market, which complicates the picture for CTOs, IT leads, and others responsible for choosing a partner. Without facilitating high-quality communications, the other benefits of SIP trunking fall flat. SIP trunk providers need to ensure that users can send and receive phone calls efficiently and clearly. Look for a provider that works with Tier-1 voice carriers to establish your calls while avoiding those who use Least Cost Routing (LCR), which compromises quality for cost. Also, look for a SIP trunk provider that has at least one point of presence (PoP) in each of the regions you want to reach to ensure low latency and call clarity. A SIP trunk provider’s geographical coverage area enables companies to easily expand the VoIP infrastructure, without adding complexity such as negotiation with new local carriers. Look for a provider with the scale to facilitate outbound calls globally while also providing different numbers across countries to facilitate inbound calls. For example, a SIP trunk provider that offers different numbers can enable a US organization to provide a local number for customers in the UK to call, rather than making those customers call long-distance. Moreover, some SIP trunk providers offer local, national, toll-free and mobile numbers, thereby facilitating client convenience while allowing organizations to choose their preferred inbound areas codes. Another factor tied to quality is the reliability of a SIP trunk provider. If calls don’t consistently go through, SIP trunking loses value. Look for providers with redundant infrastructure and multiple carrier connections across geographies to ensure reliability. Zentrunk from Plivo, for instance, promises a 99.95% uptime and is interconnected with several Tier 1 carriers in each region to maximize connection reliability. One of the main benefits of SIP trunking is cost savings. For one thing, long distance calling, including international calling, tends to be cheaper over SIP trunks. Plus, pay-as-you-go pricing models give you the flexibility to pay for only what you need vs. paying upfront for channels or bundles of service you may not need. In addition, when it comes to scaling, you can move to SIP trunking or easily add capacity to your existing VoIP system without investing in additional infrastructure. Keep in mind that different SIP trunk providers offer different costs and pricing models, so look for one that provides your business with the most cost savings based on the level of service you need. If your business has already invested in a phone network, you likely want to find a provider that offers interoperability with your existing infrastructure, rather than requiring a complete technology overhaul. A good SIP trunk provider should provide interoperability with standard soft switches and IP-PBXs. Security has become an increasing concern for businesses, and that should extend to communications networks as well. Consider how different SIP trunk providers protect your network so that calls do not get intercepted. 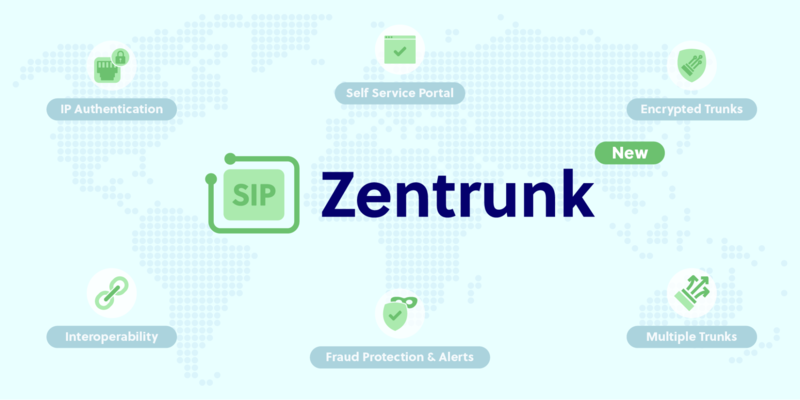 Zentrunk, for instance, provides IP authentication to protect access to your SIP trunks and encrypts trunks using Transport Layer Security (TLS) and Secure Real-time Transport Protocol (SRTP). Another benefit of SIP trunking is that it’s often easy to scale up or down as business needs change. However, SIP trunk providers can differ in terms of how they scale alongside your business. Look for one that can meet your needs in terms of how pricing changes with scale and the ease of adding new connections in different offices around the world. Similar to scalability, SIP trunk providers offer different levels of flexibility that can help your business. For example, some providers offer more flexible contracts, allowing you to adjust services as needed rather than being locked into undesirable terms. SIP trunk providers can also offer flexibility in other areas such as the ability to change phone numbers, adjust services, add IP access control lists and configure softphone compatibility. As SIP trunking becomes more prevalent, more providers emerge. However, not every SIP trunk provider has the same level of expertise. Before signing up with a provider, explore the depth of their knowledge of the technology and complex ecosystem behind SIP trunking, as those factors can significantly impact your success during complex installations, troubleshooting, scaling and more. Think about it in terms of whether you’d want to see a doctor that can recognize symptoms and prescribe a medication versus a doctor that can do the same while also understanding the cause of those symptoms and how the medication addresses the underlying issues. The latter’s expertise can make a difference, particularly when the situation takes an unexpected turn. Lastly, using SIP trunking should provide simplicity to your communications and IT landscape rather than adding complexity. Look for a SIP trunk provider that makes installation and maintenance easy from a technological and administrative standpoint. While SIP Trunking is relatively straightforward, you may have implementation questions or need to troubleshoot, especially if you’re laying a SIP Trunking solution onto your existing PBX system. Look for a provider such as Plivo that offers free support to all customers, 24/7. In addition, look for a provider that offers an intuitive way to manage and configure trunks and to view Call Detail Records (CDR) so you can monitor usage at any time. By considering these ten factors, your business can find the right SIP trunk provider for your needs to help you realize the full benefits of this technology. To learn more about SIP trunking and to see how Zentrunk can help with your communications needs, get in touch with our team.